Tells Peak Press, 9780986011900, 162pp. Do you need college in order to be taken seriously and earn a real living? Conventional wisdom says yes. But true success relies upon self-knowledge and entrepreneurship: two qualities that you can obtain effectively and inexpensively without traditional college. 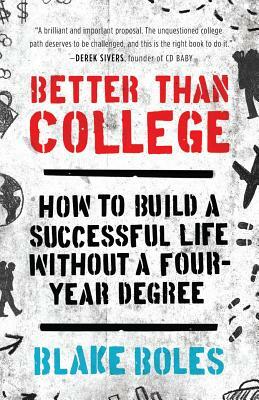 Better Than College provides the step-by-step guidance and inspiration necessary to design your own higher education. This book teaches you how to find community, stay on track, and get hired or start your own venture, all without a four-year degree. Curious college students will learn to think clearly about their motivations, plan a gap year, or navigate life after school. And Better Than College will show parents how self-directed learning can lead to a lifetime of achievement-no expensive institution required.